Hello fellow Swing Traders! I could surely use a bit of discussion here today. So, I feel like I’ve got two by the tail here in $CRUS and $MU, both popping in the Post Market after $AAPL and $INTC earnings. I missed my Limit Buy for $AAPL on Monday as my Trading Plan had me coming in underneath the low for that day. If you got in, congrats! So, what is your experience with Post / Pre Market moves translating into Regular Hours trading? To continue, since I am only in front of the computer 75 % of the day, I normally set Limit Sells from my Targets in my Trading Plans. But $CRUS and $MU both topped my Limit Sells in the Post Market and while I have adjusted Limit Sells in the past only to have the Stock finish just underneath, I was very strongly considering moving those Limit Sells up for the purpose of increasing Gain. So I was curious what you thought about these moves and how you “follow” a winner so that you do not Limit out too early, but you also preserve your Gains. What strategy do you use? I decided to post my reply on the front page for all members to see as not only is that a great question (“…what is your experience with Post / Pre Market moves translating into Regular Hours trading?) but from talking to a lot of traders & investors that use RSOTC, I am also aware that many don’t have the time or the inclination to sit in front of a computer all day before, during & after the regular trading session in order to closely monitor their positions as well as potential trade setups in order to open & close those trades when their buy points & sell targets (or stops) are reached. To the latter point, I would highly encourage the use of OCO orders in your trading & investing. The benefits apply equally to full-time traders but I believe that the use of OCO/OCA orders are absolutely essential for any swing traders that are not in front of their computer during market hours & even the pre & post-market trading session when holding positions. I recently published this video discussing how OCO orders work & the benefits of utilizing them in your trading or investing. To @MikeRam1971’s question regarding the extended hours trading session, which is comprised of the pre-market trading session from 4:00am to 9:30am ET and the after-hours trading session from 4:00 pm to 8:00 pm, there are some potential pitfalls & differences from the regular trading session (9:30 am to 4:00 pm ET) as well as some potential benefits which I have found could be used to my advantage. One of the most important differences between the regular trading session & the extended trading sessions is the liquidity or lack thereof. Typically, trading volumes on a stock or ETF are much lower during the extended hours trading sessions which leads to larger spreads (the difference between the bid & ask price). Large spreads typically equal less favorable fills on an order, assuming that your order is even filled at all. The low volume in the extended hours session also leads to many orders only being partially filled. For example, you might place an order to sell 100 shares of QQQ at the current bid price, expecting to close out your position at a your target price, only to find that your order was partially filled with only 23 shares being sold leaving you with an open order to sell the remaining 77 shares while the market turns & walks away from you, leaving you with a fractional position. Another consideration is that only the most liquid stocks & ETFs that trade with very high volume & liquidity in the regular trading session, such as SPY, QQQ, AAPL, etc., tend to have decent liquidity & fairly consistently trade in during extended-hours trading & even then, the liquidity is usually best the first & last hour or two before & after the market opens. That is generally speaking as some stocks will trade very actively in the pre-market or AH session following a big news event or earnings report while many less popular stocks & ETFs may not have any trades or very few trades during the extended hours sessions. There are additional risks & differences between trading stocks during the regular session & the extended hours sessions which I would encourage looking up via a quick web search on “extended hours trading”. Back to MR’71’s question, over the years, I’ve noticed that many stocks, sectors & even the broad market will quite often hit & reverse at a price target or key support/resistance level that I was targeting during the extended hours trading session. That is one reason that I will often include the charts of the S&P 500 or Nasdaq 100 E-mini futures in my analysis as they trade virtually around the clock from Sunday evening to Friday evening. I have two layouts which a mosaic of several dozen streaming intraday charts with the major indices, sectors, commodities & certain stocks that I’m following at any given time that I run on one monitor. I have two saved versions of that layout, one showing the streaming charts prices during the regular session & the other layout showing the same charts but displaying both the regular & extended hours trading session (the latter of which is shaded to differential from the regular trading session). Each day before the market opens, I load the extended-hours layout which gives me a quick visual on any indexes, sectors, stocks, etc. that might be moving in pre-market. By doing so, I might get a heads up on a potential breakout or gap above support/below resistance on a trade setup that I’ve been monitoring or in the case of any current position, I might see that my price target has been hit or maybe the trade is close to my stop. As such, I am not caught by surprise when my position makes a large gap up or down at the open as I would have had time to modify my trading plan accordingly in advance, assuming there was a reason to do so. After the market opens at 9:30 am, I flip to my regular session layout which provides a more clear picture of the charts & then back to the extended-hours layout at 4 pm when the market closes. Looping back to what I said earlier, about many stocks, sectors & the broad market often hitting one of my price targets during the extended-hours trading session, I learned to use that to my advantage. While the goal of any trade is to close the position if/when your profit target is hit while (hopefully) not being stopped out first, when placing an OCO order in a position to sell XYZ at 90.00 (profit target) with a stop-loss at 80.00, I will often add a conditional to the sell (profit) limit order to allow it to be filled during the extended hours trading session. In doing so, I’ve increased the chance that my sell limit order will be filled by allowing that order to execute both during the regular session as well as the extended-hours session. On numerous occasions over the years, I have been able to close a position in the pre-market or after-hours session when my profit target was hit with the trade reversing around that level and the stock opening below that price in the regular session & continuing to fall from there. In those cases, I would have never hit my price target had I not checked the box to allow my order to also be filled in the extended-hours session & ended up giving back profits on the trade & being forced to close it at a less-favorable price. On the flip-side, the same volatility & often large price swings & reversals that occur in the after-hours session can cut both ways, often taking a stock down below your stop-loss price. As the goal of any trade is to avoid being stopped out, I do not set my stop-loss orders to be filled in the after-hours sessions. First of all, I prefer stop-loss vs. stop-limit orders. Stop-loss orders, as well as market orders, are not available in the extended-hours trading session so that rules out those as available order types. Second, as my goal is to avoid being stopped out & wild prices swings, often marked with big reversals, are common in the extended-hours sessions, I like to use that volatility to my advantage by allowing my profit targets to be hit while not allowing my stops to be clipped. As such, when I set an OCO order, I will set a limit order (GTC, good-until-canceled) at my profit target, with the option checked to allow that order to be filled in the extended-hours session, along with a stop-loss order that can only be filled during the regular trading session. Finally, to expand on the benefits of monitoring a stock, index, ETF, etc. in during the extended-hours session & why I like to incorporate analysis on the major stock index E-mini futures into my analysis on SPY & QQQ, I’ll use the following example. In your gravatar image, MR’71, it appears that you are wearing a pair of polarized sunglasses. As an avid boater & recreational fisherman living on the west coast of Florida, I wouldn’t leave the dock without a pair of polarized sunglasses (even keep a spare pair on my boat, just in case). 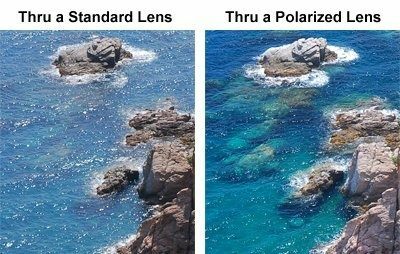 Using polarized sunglasses allow you to see not just what’s one the surface of the water but also objects, including potential hazards such as rocks or even fish you normally wouldn’t see without polarized lenses. Using technical analysis when actively trading without watching how the major stock indexes and any sectors or stocks you are following are trading after & especially before the market is akin to boating or fishing without polarized sunglasses. If a position that you are holding had some big news headline released since the previous close or reported earnings that morning or the previous evening, the stock could be indicated to gap significantly higher. Watching how stocks & the major stocks indices trade before & after the market provides a similar expanded view that often helps to see technical developments that you might normally miss when only viewing charts of the regular session trades. Knowing that in advance if a position is indicated to gap higher or lower might allow you to book profits, modify your stop or maybe pull (cancel) your sell limit order to close the position at your profit target. For example, if a stock (or the market) is now clearly poised to gap above a key resistance level, which would open the door for additional gains on your trade, you might decide to raise your stops & profit targets. You mentioned the big pop & drop on INTC in the wake of their earnings report after the market closed last Thursday. 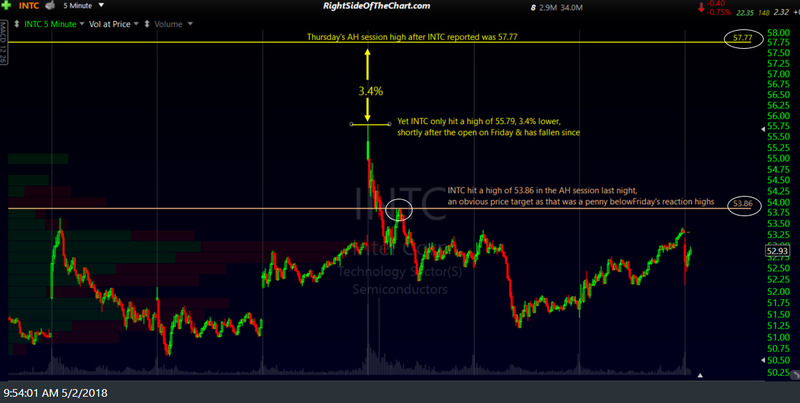 The first chart below is a typical 5-minute period chart of INTC showing the regular session trades over the past week. 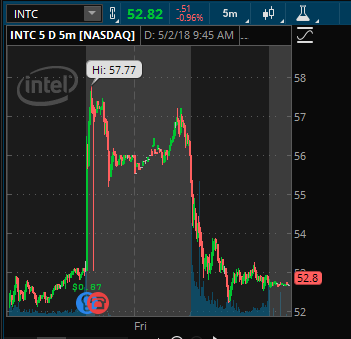 I’ve marked the “high-water” mark, where INTC traded on Friday when INTC first began trading during the regular session following their earnings report the previous evening. On that chart, I marked the AH session high of 57.77 that occurred shortly after the earnings report on Thursday, which was about 3.4% above the highest point that INTC traded on Friday during the regular session. The two charts below that are 5-minute period (5-min candlesticks) charts, the first showing the huge post-earnings rip in the AH session (lighter shaded area), with the daybreak line in the middle of that shaded area followed by the pre-market trades on Friday morning. 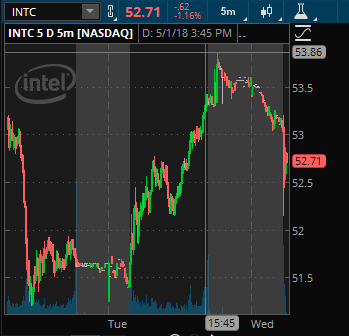 The black area that follows Friday’s regular session & you can see that INTC dropped like a rock immediately following the open. The second 5-minute period chart shows the regular & extended hours trades (shaded) on INTC over the past few days. Note how the rally that started at the open yesterday continued into yesterday’s AH session with the stock reversing shortly after the close & selling off since, with impulsive selling starting to kick in before the open today as more & more traders started to come online. Take advantage of the benefits of using OCO orders. Consider setting you profit target (GTC sell limit order on long positions or a GTC BTC limit order on short trades) to allow those orders to be filled outside of regular trading hours. Even if you don’t plan to trade in the after-hours & premarket trading sessions, consider monitoring how your positions, as well as the broad market or any sector that your positions might be affect by, are trading before & after the regular trading session, especially around earnings season & periods of elevated market volatility. If you do plan to place any trades outside of the regular trading session, become familiar with the potential pitfalls as well as the types of orders that are & are not accepted in the extended-hours trading session. Most brokers offer conditional order types, such as OCO & OCA orders as well as the ability to place & view extended hours trades on their charting platforms. If you are unsure how to do so, your broker’s support team will walk you through those steps as well as provide you with educational resources & articles. Nice post! I noticed that “67” should be “77” for shares remaining when you sell 23 out of 100 shares of QQQ (in your example). My posts often contain typos & grammatical errors (as well as the occasional mathematical error like this) as many are time-sensitive & I usually post them without proof-reading, only proofing them after-the-fact to correct any errors if & when time permits or if someone points out an error. Thx again. Thanks for the great answer and sharing your experience! I’ve checked both my brokers and neither seem to have the feature to set those Conditionals in that way. There is good support for real-time extended hours charts and trades, just nothing that bridges both sessions so easily. I’ll have to take a look around at some different brokers. If nothing else, just knowing that especially around ER I might want to be more manual about it. Can be the difference in being in and being left out. Thanks again!